Vegan Brunch Review and Giveaway | Cook. Vegan. Lover. The first vegan cookbook I ever bought as Vegan with a Vengeance I have used it so much over the years that it is stained with food and worn to pieces. Over the years I picked up Vegan Cupcakes Take Over the World which I loved and actually used 2 of the cupcake recipes for my wedding cupcakes. Then I was given a copy of Veganomicon by my loving husband for Christmas 2007 – I honestly haven’t used this book as much as VWAV & VCTOTW and was actually disappointed with it compared to Isa’s two earlier books. However Isa Chandra Moskowitz has redeemed herself with Vegan Brunch which features a number of great vegan brunch recipes. Vegan Brunch features savory recipes such as tofu scramble, frittatas, polenta ranchers, Tofu Benny and perogies. Of the savory dishes I tried the tofu scramble which was delicious, the texture was almost creamy which I loved and really had the texture of scrambled eggs (or at least what I remember-it’s been awhile). I also made the Cornbread Waffles which I loved because some days you just don’t want to have a sweet waffle and this was a great savory waffle. Lastly I made the Tofu Benny which I loved! The hollandaise was delicious and the Diner Homefries were nice and crispy. To be honest I have yet to try any of the sweet brunch options and am actually much more of a savory breakfast person. I actually did have plans to make the Banana Rabanada (Brazilian French Toast) this morning but my husband forgot the baguette on his desk at work. I guess I’ll make it another day! Some other dishes I have made and loved where the Samosa Mashed Potato Pancakes, Chesapeake Tempeh Cakes and the Mushroom Gravy. I made the Cheaspeake Tempeh Cakes for some of my omni friends and they couldn’t get enough of them. I ate the mushroom gravy this morning with my scramble and am using the leftovers in my greenbean casserole. Over all this is a great book that I would recommend to anyone who loves breakfast. This book is great because although many cookbooks have breakfast sections none have the focus and devotion to breakfast items like Vegan Brunch. You can pick up your copy of Vegan Brunch on Amazon. Now that you have read what I have to say about this book I am going to give you a chance to win a copy yourself. If you would like to win please leave a comment letting me know what your favorite brunch dish is by November 24th, 2009. I will be contacting you shortly to get your information. Congrats! Thanks for to all of you that participated. Look out for 12 Days of Giveaways in December! 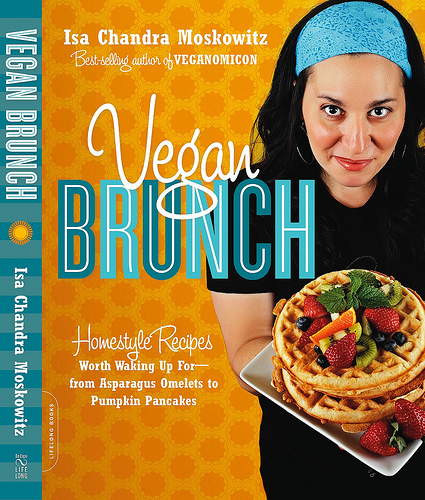 This entry was posted in Book Review, giveaway and tagged Book Review, giveaway, Isa Chandra Moskowitz, Vegan Brunch. Bookmark the permalink. Fruit with some oats and maple, baby! I already have a copy, but I wouldn’t mind another one to give away as a gift for the holidays. If it wasn’t for this book, I never would have discovered black salt, which really gives things an eggy flavor. My favorite brunch dish is a veggie-packed tofu scramble for sure! i’m already following you on twitter, thanks girl! blueberry pancakes with a side of homefries and vegan sausage. yums! bowl of warm oatmeal with a lot of fruits! Tofu scramble with veggies( usually mushrooms, peppers, onions and potatoes), broiled tomatoes and a bit of toast with jam is one of my most often enjoyed brunch dishes. Hmm… plain ol’ oatmeal with lots and lots of fruit and nuts mixed in. Hooray, for vegan breakfasts. My staple has been making oatmeal with soy milk. But I would love the change to learn more breakfasts recipes. It’s always interesting when I see that some aren’t gaga over Vcon. That book is my cooking bible! I love it so much. The seitan piccatta is my favorite dish EVER! Ha ha. If you love savory, I highly suggest the omelet. The denver is amazing with hickory liquid smoke! And I love the ricotta, tomato and basil one. Mmm. Damn, now I want omelets! My favorite brunch is pancakes with a savory side like hash browns! I just love fried potatoes and onions with scrambled tofu with any veggies on the side. Tofu scramble with whole wheat toast and orange marmalade spread. i thought i was the only person a little disappointed with v’con. i too absolutely adore vwav, and while i can appreciate some rock’n recipes in v’con, as a whole, i was a little let down. i’m glad vegan brunch has proved to be glorious, and i still can’t believe i don’t own vegan cupcakes take over the world. christmas wishlist is what i’m thinking. i’d love a chance to win vegan brunch. and my favorite brunch dish would have to be tempeh hash. we toss in some tempeh, potatoes, green peppers ‘n onions, a little sriracha and a lot of garlic. so yum! Tofu scramble with warmed tortillas , mmm mmmm! I like a good ole fashioned tofu scramble! I would say currently my favorite is soysage and waffles mmm. For a while it was tofu scramble or soysage, biscuits, and gravy. So many good choices! Pancakes all the way! We made vegan pancakes this weekend and my family did not like them, lol. I wonder if the book has a better recipe? I love Veg McMuffins for brunch when I am feeling really ambitious. Hucklberry pancakes with huckleberry syrup! And I’m already a fan on facebook, woohoo! p.s. i became a fan on facebook!